Nebraska’s schedule could not have been set up much better for what the Huskers needed at this point in the season. Two weeks ago, the Huskers were reeling after a bad loss to Northern Illinois. Last week, Nebraska got back on track with a much-needed win, but one couldn’t really feel too good about it after beating lowly Rutgers by just 10 points. However, Saturday’s 28-6 win at Illinois is something to give the fans hope and a reason to believe the team is on an upward trajectory. Granted, Illinois was bad — as in, probably worse than Rutgers bad — but Nebraska put forth its most complete effort of the season. The Huskers out-gained the Illini 411 to 199. Quarterback Tanner Lee was incredibly efficient, completing 17 of his 24 passes for 246 yards and three touchdowns while the running backs totaled 177 yards on 32 carries (5.5 yards per tote). On defense, Nebraska held the Illini without a touchdown and recorded 10 tackles for loss, including five sacks. Illinois did not offer much resistance, but facing lesser opponents hadn’t resulted in anything close to a complete game at any point in the season prior to Friday. In this game, those watching could start to see what Nebraska wants to look like. Nebraska’s offensive line kept Lee clean in the pocket for much of the game including almost the entire first half. They had some slip-ups late, but the new-look front line including Michael Decker at center and Brenden Jaimes at right tackle held its own for the second straight week. Lee put forth arguably the best performance of his college career and was incredibly sharp distributing the ball all over the field on time and on target. At one point, he completed 10 straight passes. Even more importantly, he made perhaps one bad decision all night and showed progress by throwing the ball away once or twice and taking a sack on another snap rather than trying to make a play that wasn’t there. Nebraska got enough out of its ground game as well with Devine Ozigbo averaging nearly six yards per carry and Mikale WIlbon averaging 4.6 per run. For the second straight game, the Huskers were able to salt the clock away by jumping on Ozigbo’s back and having the junior carry them to the end. Nebraska marched right down the field and scored on all three of its first-half possessions. It hit a rough patch early in the second half with a three-and-out followed by a fumble but reasserted control with a 93-yard touchdown drive. Meanwhile, the Blackshirts kept the Illini out of the end zone. It wasn’t perfect, but it was the closest to it Nebraska has been this season. After a disastrous first half in Eugene and the startling loss to Northern Illinois, Nebraska has rebounded to open 2-0 in Big Ten play and is back above .500 at 3-2 overall. Next up is the Huskers’ biggest test to date. 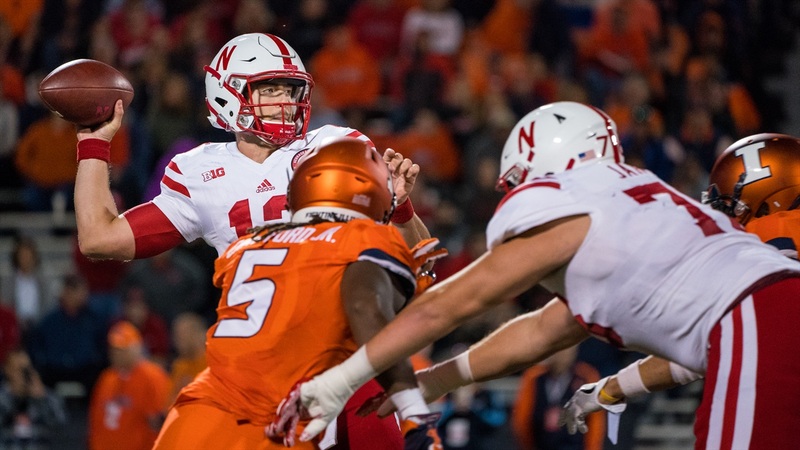 What Nebraska did against Illinois likely will not be enough to beat Wisconsin, but the Huskers were able to prove to themselves they are capable of being who they want to be. Now Nebraska has to be that team against a Badgers squad built on imposing its will in the trenches on both sides of the ball. Nebraska looks to have found itself in Champaign, which is about all one could have asked for from that game. Is that team good enough to hold its own against the West Division favorite? Perhaps. Perhaps not. But there is no doubt that it is better equipped to do so than the Nebraska team from two weeks ago.